ALLEGRA BOVERMAN/Staff photo. Gloucester Daily Times. Gloucester: Members of The Cape Ann Farmers’ Market’s Backyard Growers Program. The organization will hold the second of two garden trainings this Saturday, March 31, from 9:30 to 11:30 a.m. at the Open Door, 29 Emerson Ave., (rear entrance). 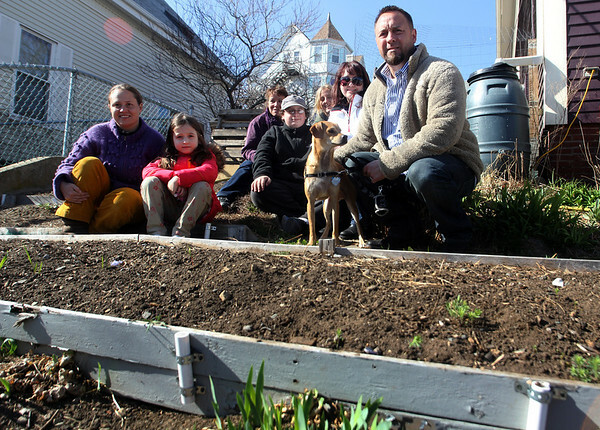 Front row, from left, are: Lara Lepionka, Antoinetta Vila, Noah McNair, Randi Vila, John Vila and their dog Nino. Second row, from left are: Becky Nimon, Robyn McNair and Alison Wotonski of The Food Project.